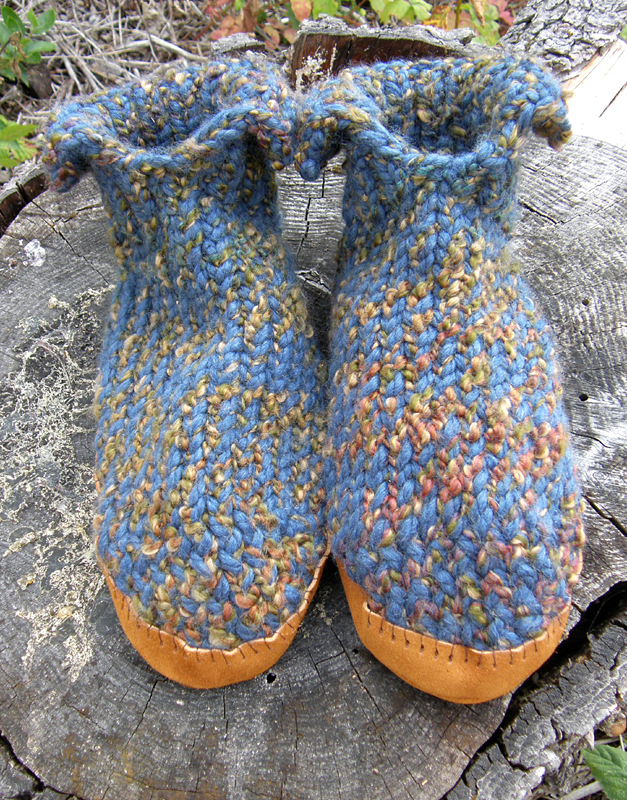 I recently completed these beauties… a new take on the Chunky Slipper Socks. Aren’t they just totally and completely snuggy looking?? If they look just a tad large, that’s because these are a men’s size 10.5 (11″)! 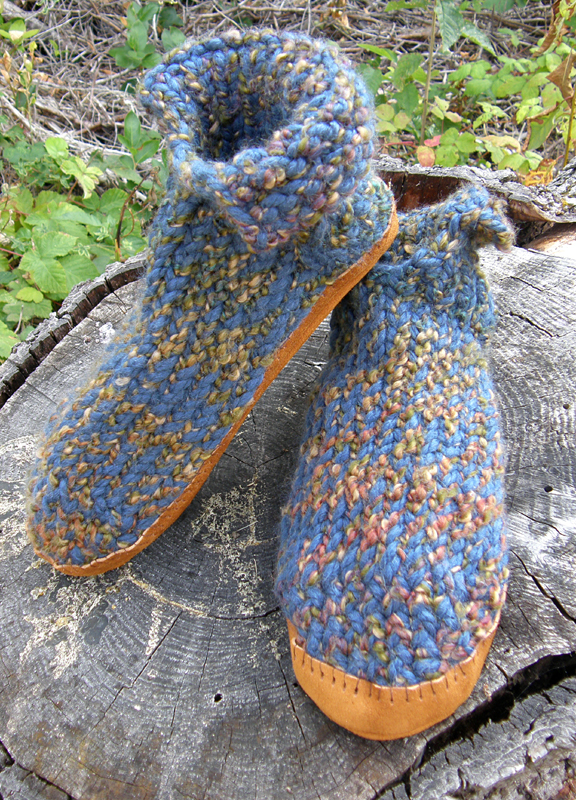 I was making these for a cousin of mine and thought that he would enjoy this version of the slippers with a “Romeo” style and suede leather bottoms. 🙂 Pretty nifty upgrades, right? My looming partner is Xander. He decided to sit for a while while I worked. Although I do have to tell you that this was the calm after the storm, lol. He had just settled down after trying to attack, snag, bite, and run away with my fun string! Kittens and a house full of fiber can be quite tricksy at times. They make quite the perfect leg warmers, though! Oh, and don’t forget about the Loom Along coming up in October for the Servin’ Up Stripes, Loom Knit Table Runner! More info on that coming up soon too. Have a terrific rest of the week, All! 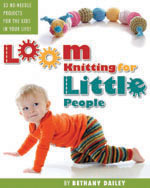 This entry was posted in Book Progress, Crafting, Loom Alongs, Loom Knitting, Looming Patterns, New Projects, Pets. Bookmark the permalink. Hi Bethany, what stitch are u using for the scarf? I only have used both sides of a board once and that was a basic stitch. i love those slippers! I have a pattern some where, and once I get my pea pods off the looms (2 of them to get done QUICK) I just may have to start those! 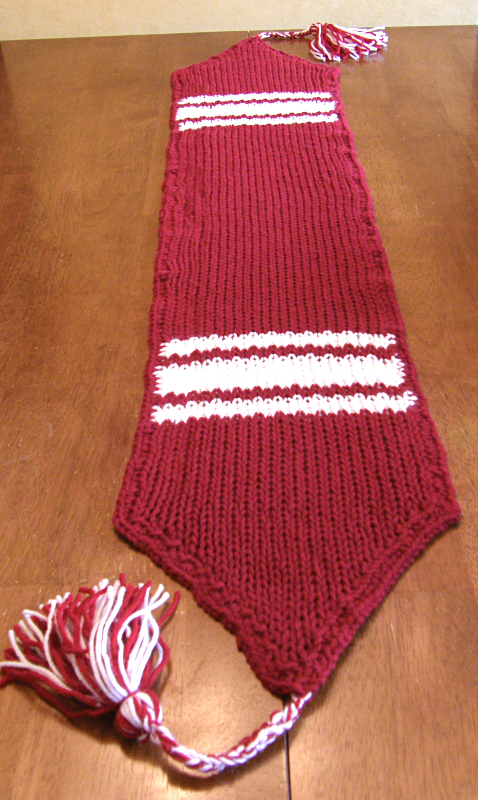 Josie, the main stitch is the twisted rib stitch for double knitting, also included are bands of 4 repeats of the honeycomb stitch (or interrupted rib stitch). You can find a good article on how to wrap the pegs here: http://www.brighthub.com/hubfolio/heather-schulte/articles/102940.aspx 🙂 I think it’s a really pretty look on double knit projects and is super easy to do! I love the soled Romeo slippers. I also love your leg warmer. 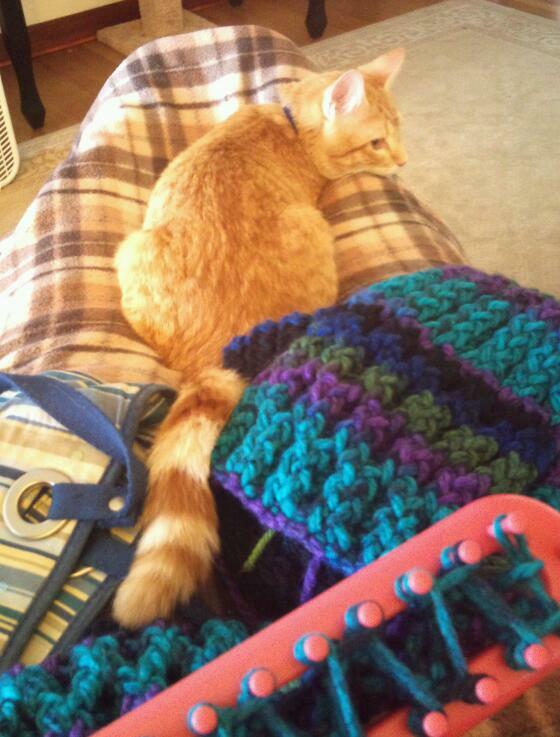 LOL I have a cat also that wants to sit in my lap while I loom.